When Edward Thibeault inherited property after neighbor John Houlihan’s death in 1964, me might have expected a clean-up would be in order, after all, the words “unkempt” and “dilapidated” were used to describe the house and surrounding land. 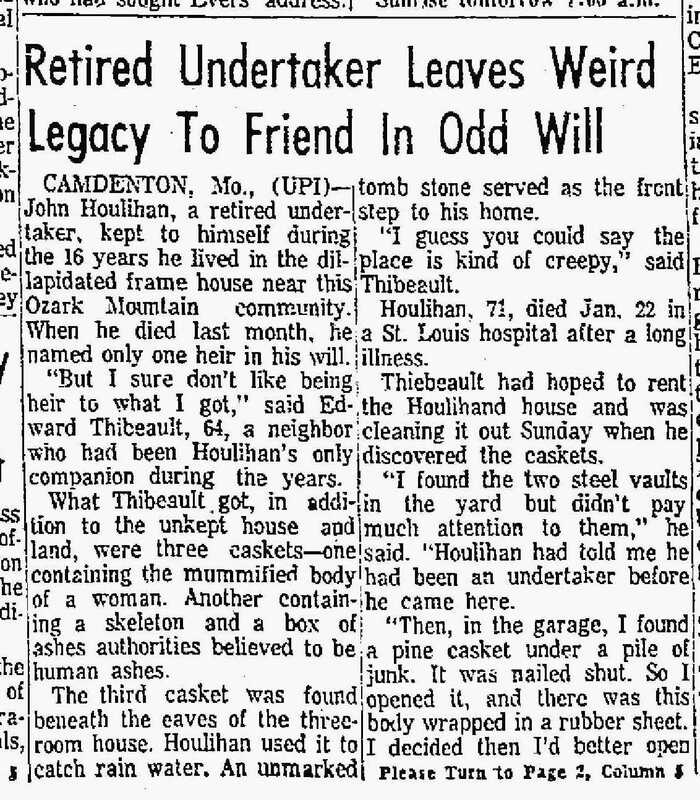 The extent of what relationship, if any, that existed between the two men isn’t clear but because the first article that I found concerning this bizarre Missouri tale says that Houlihan was somewhat of a loner, it doesn’t seem like they were very close. If they had been friendlier Thibeault might have noticed some of the macabre items inside his neighbor’s three-room dwelling. 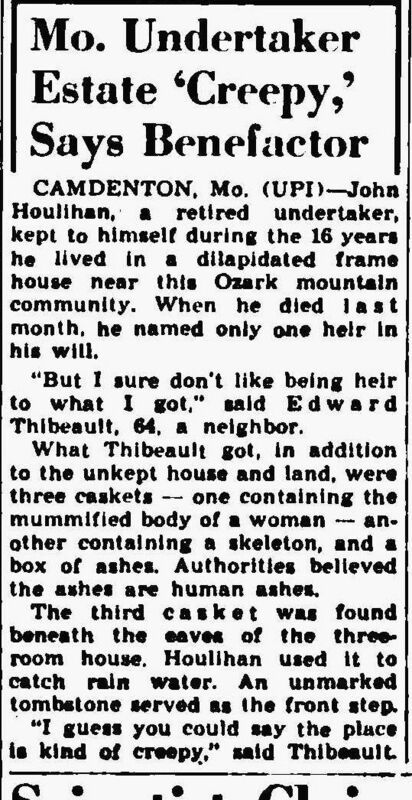 While tidying up the property, which he waned to rent, Thibeault (and/or workers) discovered that Houlihan, a former undertaker, had been living with a mummified woman’s body, a cardboard container of cremated ashes, and a skeleton. The skeleton and mummy were both in caskets while a third casket was being used to collect rain. A blank tombstone served as Houlihan’s front step. A pair of steel vaults sat in the yard. Thibeault’s description of the property as “creepy” was putting it mildly. 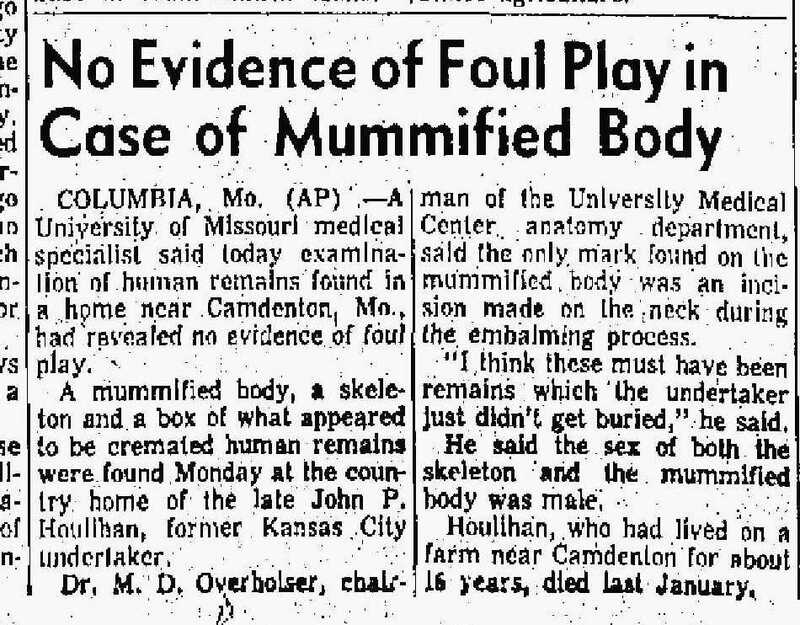 There was speculation that the mummified body might have been Houlihan’s wife Emily, who’d died in 1954 in a state mental hospital on the basis that the mummy, like the wife, was elderly and had poor posture. 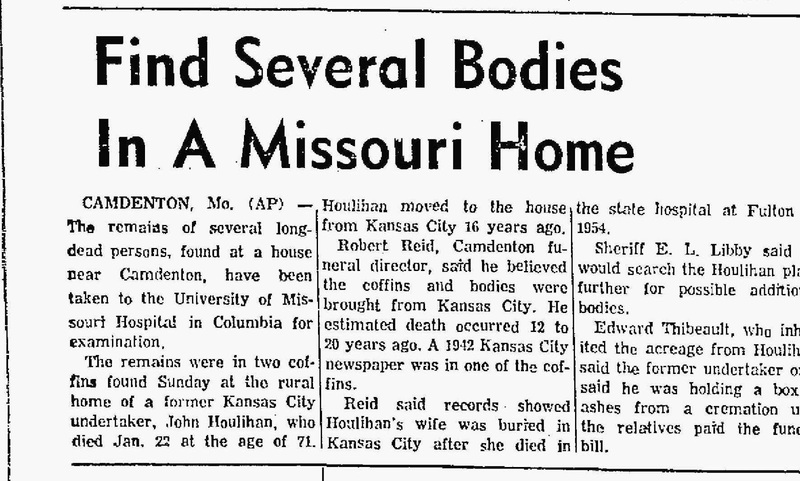 Houlihan lived with another lady after his wife’s death, but she had also died since and was reportedly buried in Camdenton. Houlihan once told Thibeault that he was keeping the cremains of someone whose family didn’t pay the bill, but he didn’t think he was serious. After an investigation, a medical examiner announced that there was no indication of foul play on Houlihan’s part and that the skeleton and mummy were both male. They, along with the ashes, were people that he failed to bury while operating his funeral home. Because he’d closed that business 16 years before his death, Houlihan had been living with the remains for at least that long. Do you know if they ever discovered the identities of those bodies? His wife, Emily, was my great-grandmother's sister and this story just blows my mind! Emily went crazy while married to him (I wonder why!) and my mother's family had to go and pick her up and return her to KC, and later to the state mental hospital in Fulton. Such as tragic ending for her. I'm curious – is this home still standing? That's terrible about your great-aunt. It sounds like Houlihan might have had some issues as well. As for the house, I have no idea. I believe I read that the neighbor who inherited the property passed away several years after this story. If it was in such poor shape then, odds are that it was either demolished or fell down on its own. You never know, though.